When you take a look at your marketing mobile app it’s not always easy to figure out exactly how many people have viewed your app or how they are interacting with your brand. With websites it’s a little different because you can integrate powerful tools to do some A/B split testing, see when people drop out of your site and even track which buttons people are clicking on. Unfortunately this is not always as easy with marketing mobile apps, but there are still some ways to use the information provided to you so that you can make changes to improve your overall business and mobile app. The best way to see how many people are responding to your marketing efforts is by checking the count of users who downloaded your mobile app. If you go into iBuildApp you can always just open up one of your apps and click on the Mobile App Downloads button to see a nice graph of your trends. This is the crown jewel when it comes to measuring engagement on your mobile app. After all, if no one is downloading your marketing mobile app then you can’t honestly assume that your marketing tactics are working that well. Click through this button to see graphs and plan your course of action based on past trends. Every Time you design a marketing mobile app in iBuildApp you also get a mobile site that people can visit on their phones. Although less people in general typically use the mobile sites, it’s not uncommon for people to occasionally use them. You will also find other users who only use mobile sites, so you have to consider these customers. Click on the Mobile Site Visits button in your iBuildApp dashboard to view large graphs of how many people have been looking at the mobile site over the past few months or weeks. Once you checkout the trends you can start planning for the future and seeing if any of your current marketing efforts are actually working at all. Money usually speaks louder than most things, so why not implement a monetization campaign with your mobile app to see how much money you can make with it? This is similar to placing an ad on Google to see how many people click through to your marketing mobile app or website. Instead, you simply use the revenue numbers to see how much people are engaging with your mobile app. If users feel willing to click on ads in your mobile app then you are certainly doing something right to maintain their engagement. If no one clicks through your mobile ads than you might need to look into your marketing mobile app a little further to understand exactly what needs to be changed and how you can go about doing that. 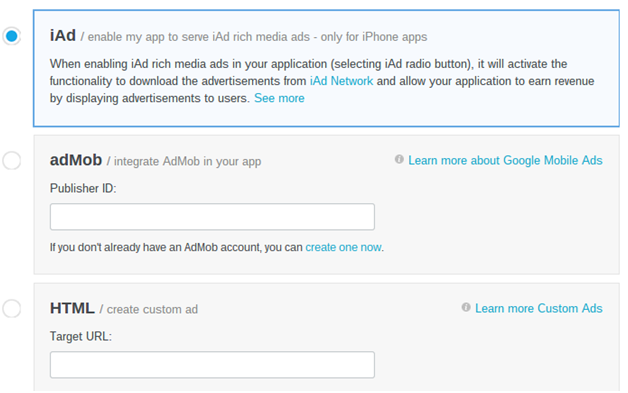 If you go into your marketing mobile app design area on iBuildApp, you can find the Monetize option to set up ads on your mobile app. Then simply choose between the different ad presentations and later you can check to see how much money is flowing in because of these ads. Sometimes you might want to see how many people are scanning your marketing mobile app QR code or how many people click through on a promotional banner ad for your mobile app that you put on your website. In order to do this you can just grab the links that are created in the Promote area of iBuildApp and punch them into a service like Bitly. This service lets you create a shortened link that you can then place back into the code for a QR code or banner. Bitly then tracks how many people click through the link, so you can automatically see how your promotional efforts are working. Let us know in the comments section if you have any questions about quick ways to measure success in your marketing mobile app. This is particularly important if you plan on making a business out of it by building apps for various companies in your area. Share your thoughts and give us any tips you might have with your experiences.